Wrexham have extended the loan stays of Cardiff City teenage striker Jon Brown and Liverpool midfielder Ryan Flynn for another month. 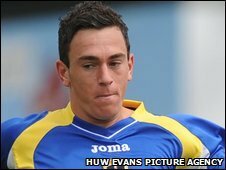 Wales Under-21 international Brown has impressed for the Blue Square Premier side, scoring one in five starts, since joining Wrexham in November. "Jon's loan stay will be extended," confirmed Cardiff boss Dave Jones. Liverpool academy graduate Flynn, a 20-year-old central midfielder, has made two appearances at the Racecourse.